In 1875, lingering discontent within the Ottoman Empire in the Balkans erupted in a chain of furious events that culminated in a major war. High taxation sparked a revolt in Bosnia and this was followed, early in 1876, by a Bulgarian uprising aimed at overthrowing the Turkish rulers. The Turks responded mercilessly hoping to put a quick end to the rebellion and discourage further unrest by making an example of the Bulgars. However, outraged by the atrocities, the Serbians rose up to support the oppressed Bulgars. The Russians, who always resented the Ottoman Empire and even had ambitions of capturing Istambul, supported and encouraged the Serbs in their revolt. Serbia declared war against the Ottomans in June 1876, and Russian volunteers, in a wave of patriotic enthusiasm for the Slavonic people, joined their army ranks. However, in July and August, the ill prepared Serbian army suffered several crushing defeats from the Turks, and on August 26, Serbia pleaded with the major European powers for mediation in ending the war. Following the conflict, the pianist Nikolai Rubinstein, organised a concert for the benefit the Russian volunteers wounded during the conflict. He asked Tchaikovsky, who was a sympathiser with the Slavonic cause, to compose a piece for the occasion. 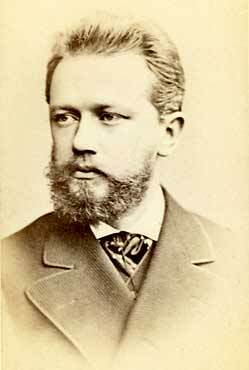 Tchaikovsky responded with the Slavonic March which was composed in just five days. It was premièred at the benefit concert in Moscow on the 17th November 1876 receiving an enthusiastic response. The march is highly programmatic in its form and organisation. The first section describes the oppression of the Serbians by the Turkish. It uses two Serbian folk songs. The first "Come my dearest, why so sad this morning?" is played at the outset, as Tchaikovsky directs, "with the movement of a funeral march" It is followed by the second folk song which is more optimistic in character. An episode follows, describing the atrocities in the Balkans, in which Tchaikovsky uses his mastery of the orchestra to build a tremendous climax, at the height of which the first folk song returns, fortissimo on the trumpets like a plangent cry for help. The tempestuous mood subsides giving way to the second section which describes the Russians rallying to help the Serbs. This is based on a simple four bar melody with the character of a rustic dance which is passed around the orchestra until finally it gives way to a solemn statement of the Russian national anthem "God Save the Tsar". The third section of the piece is a repeat of Tchaikovsky's furious orchestral climax, reiterating the Serbian cry for help. The final section describes the Russian volunteers marching to assist the Serbians. It uses a Russian tune, this time in the tonic major key and includes another blazing rendition of "God Save the Tzar" prophesying the triumph of the Slavonic people over tyranny. The overture finishes with a triumphal coda for the full orchestra. The Russio-Serbian alliance did, in fact, eventually triumph. Russia declared war upon Turkey in April 1877 and after a short war the Turks sued for peace in January 1878. The Russians bowed to international pressure and, rather than pressing home their victory, settled for the independence of Serbia, Romania and Montenegro. It is amusing to note that Walt Disney Studios incorporated some of the music from the Slavonic March in the film "Aladdin" apparently confusing Slavonic and Arabian folk music styles. Tchaikowsky's Slavonic March was performed by the Portobello orchestra on the 19th April 2008, conducted by Anthony Weeden.